It's hard to imagine life without addresses. How would you receive mail? How would you call emergency services? Or how would you simply direct someone to where you live? We live with Google Maps or GPS systems where we can type in addresses and get immediate directions. We can follow these on our cell phones. But despite the fact that, since 2010, more than half the world now lives in cities and towns, many millions of people live without addresses and are essentially unmapped. As part of its National Urban Policy, the president of Ghana tasked 215 districts with naming and addressing streets and properties within an 18-month timeframe. a year. 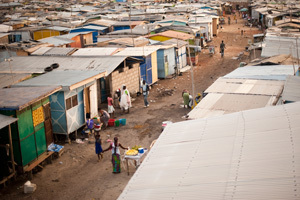 Rapidly expanding informal settlements -- slums -- are rarely planned, and very often metropolitan authorities do not know who is living in their cities. Without knowing this, they cannot provide basic public services, nor can they collect taxes effectively to pay for the services. The people living in these settlements are rarely consulted on their service needs. Thus, the problems of living without addresses go well beyond directions and mail. One country that is seeking to proactively tackle this problem is Ghana. As part of its National Urban Policy, the president of Ghana tasked 215 districts with naming and addressing streets and properties within an 18-month timeframe. In light of this, Global Communities, funded by the Bill & Melinda Gates Foundation, partnered with the twin cities of Sekondi-Takoradi to undertake a comprehensive street naming and property addressing process. Sekondi-Takoradi is about the size of Atlanta and, because it is set to grow rapidly with the recent discovery of oil, we saw it as a priority. There are huge economic and business benefits to addresses, but the main initial purpose of the mapping and addressing is to ensure that the half-million residents of Sekondi-Takoradi can get appropriate and well-funded public services. In 2013 we trained 160 community volunteers and, using GIS mapping, worked with the metropolitan authorities to map and name 3,440 streets and alleys and number approximately 42,000 properties in the city. The naming process is an exercise in creativity, ingenuity and patience. The planning members brainstormed categories and developed exacting criteria. 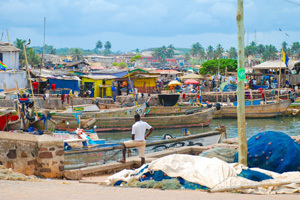 For example, some streets were named after deceased local chiefs and assembly members; others were identified by names of animals, flowers or oils; others still were more exotic, and today residents of Sekondi-Takoradi now live, for example, on Termite Alley and Galaxy Street, while their neighbors live on Freedom Road, Blizzard Close, Jerk Close and Aristotle Close. 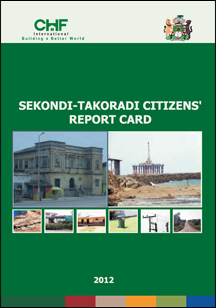 We also worked alongside the Sekondi-Takoradi Metropolitan Authority to develop an effective system of property taxation, revaluing properties and establishing levels of taxation that ensure the citizen service priorities are funded, but which also protect the poorer residents by developing a rates system that means they will pay less. Finally, in order to develop incentives for the municipal authorities to work with local communities, we provided small community grants of $2,000 that are matched by the local authorities to build latrines, street lights, market sheds and other projects. , where 834 households were interviewed to identify citizen priorities for services across the city. In 2015, when the project comes to a close, we will run another Citizen's Report Card process to measure how citizens' needs and priorities have progressed and how well they have been met. In the two years since the project was launched, we believe it is showing an effective and inexpensive way of partnering with local authorities to map out the future of African cities that ensures citizen participation is at the center of every step forward in urban evolution. The process of mapping and addressing is a technical and technological one; but at its core, success comes from involving the community in partnership with the Metropolitan authorities at every step so that they "own" every aspect of the cities in which they live. You can read about the entire process in more detail in a paper written by Global Communities' Ghana staff.